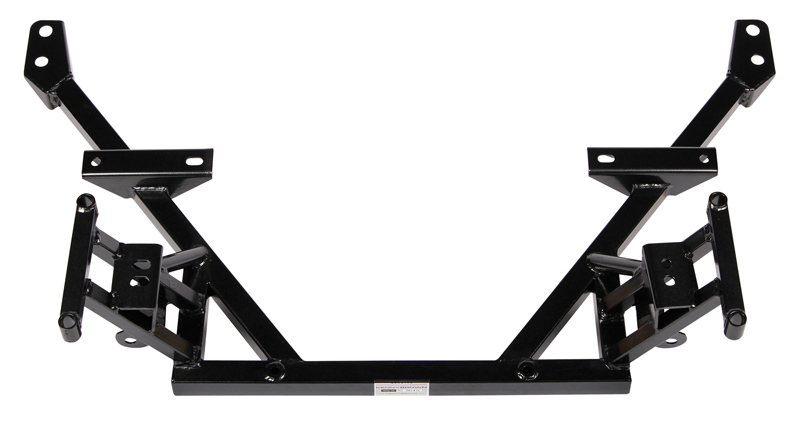 The Kenny Brown Performance Lightweight Tubular Front K-Member for Mustang will bring the handling performance of your ride up to the next level. It is a huge step from stock because of the endless amount of benefits you get when you install this bad boy on the front of your American muscle car. First off, this system is super light weight because of its tubular design and helps distribute the car's weight more evenly. You know what that means? Flatter and more stable cornering! The mounting points for the front lower control arms are also positioned to decrease amounts of dive, lift and traction loss you would experience in a stock Mustang. Just making this one change to your front suspension setup can get you racing around the track much faster and safer than before. There are three main characteristics that this lightweight tubular front K-member add to your Mustang: Grip, Stability, and Safety. The way that this front end changes the geometry of your steering actually contributes a lot to the handling and grip of the car. It hunkers the front of the car down and prevents lift and dive, which can take a toll on the amount of traction the car has in the corners and straights. It also makes the car more stable by preventing bump-steer, which occurs when a lowered car hits an irregularity in the road and gets jerked in a random direction because of the instability of the front suspension components. And in the end, this creates a safe car hat is worthy of both the streets and the track. Because in the end, the Kenny Brown Performance Lightweight Tubular Front K-Member is designed for safety AND performance.